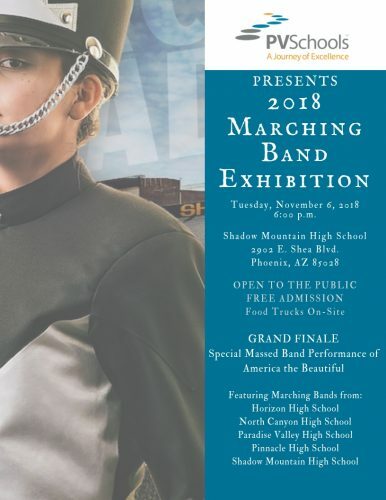 The annual Paradise Valley Unified School District Marching Band Exhibition will be hosted by Shadow Mountain High School this year! It’s a great evening showcasing the district marching bands and bringing together band students from Horizon High School, North Canyon High School, Paradise Valley High School, Pinnacle High School, and Shadow Mountain High School. The public is welcome to attend and we encourage all of our band families to share this great event on their social media and with local businesses. If you’d like to hand out flyers, you can obtain a flyer by clicking HERE and downloading it directly to your computer. We will have food trucks on-site so make an evening of the exhibition! If you’d like to place an ad in the souvenir program, check out all the details and pay online by October 19th. Find out more about Shout Out ads for students.